In case you have not yet seen it, ‘Donation’ the on-going exhibition at the Lusaka National Museum that honours the outgoing Norwegian embassy in Lusaka’s donation of art to the Lechwe Trust a charitable organization for the visual arts in Zambia committed to reining in outstanding works against sale abroad is still showing for the next few days. For a major collection of art that has been accumulated for just over a 20 year period, 40 individual pieces does seem small, more so if these works belong to a foreign embassy that has been one of the biggest supporters of the visual arts in Zambia, having played an active role through funding artists workshops, exhibitions and scholarships by way of its bilateral agencies. But it can be understood that a single building – which is not a gallery or museum – can only have so many works on permanent display. Undeniably, during their stay the Norwegians accumulated more than five times the volume of work in the collection, seeing to a large extent ,works by Zambian artists may have found themselves in the personal collections of diplomats that have rotated at the embassy over the years and have understandably wound up in Norway or other parts of the world which is why it may be seen as a plus that work by some of the country’s most influential artists of the past few decades will not leave the country but should stay here in the provisionally safe custody of the Lechwe Trust. Lusaka’s Linda Township, a high density slum. He taught his many students how to work hard woods such as ebony, mubanga and mukwa that was preferably used as supports for pit latrines because of its non-corrosive qualities, when the residents of Linda began the transformation of their sewer systems to septic tanks; they did away with the old wood preferring brick and concrete. Tembo and his band of apprentices would then harvest this discarded wood for use at the studio. Two of his students John Miti and Jesat Mbewe also have works Africa World Cup (2009) and Zilile Ng’oma (2005) respectively in the Norwegian collection. 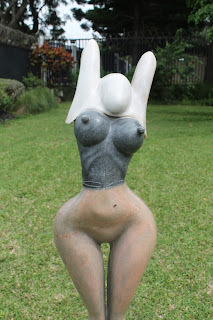 The sculptures also feature a series of abstract marble carvings by David Chirwa that feature his distinguishable style that is characterized by a combination of course and smooth textures on their surfaces. Eddie Mumba one of Zambia’s foremost subtractive sculptors who is also a lecturer at the Evelyn Hone college has a fascinating selection of wood and metal pieces in the collection, one of the most interesting being a large porcupine meticulously fashioned from reclaimed metal bars. 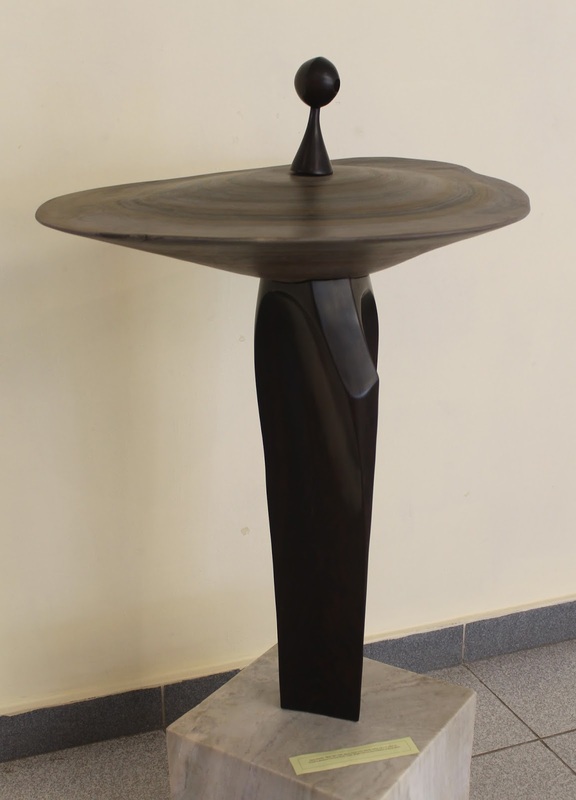 Robert Nyirenda (1958 to 1998) who started working in wood at the tender age of 12, came to Lusaka in 1968 and started working in soap stone and later granite and marble also has work in the show. His style is particularly distinctive because he worked in an era – particularly in Zambia -- when power tools were extremely expensive and therefore out of reach for artists. His works have a course mallet and chisel feel to them with distinct surfaces that bare a charming jaggedness. Andrew Makromalis a versatile artist who is also one of the country’s very few ceramists has two earthenware vessels in his familiar misshapen style as part of the collection. As earlier alluded, the two-dimensional works in the collection are both representational and sentimental with a little exceptions, these being a few abstract paintings by Vincentio Phiri, Patrick Mumba and William Miko. 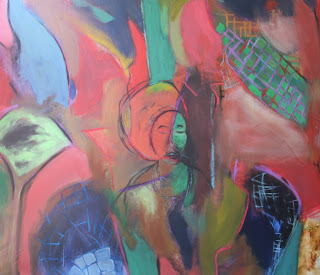 Phiri is a celebrated abstract expressionist on the Zambian art scene; all his three works Back Yard (1997), Power of Love (1997) and Wandengeya Road (1997) are in his distinctive, totally abstract manner reducing the value of his paintings to swift lines and kaleidoscopic colours that evoke motion. The works in this collection are a rare example of the artist branching away from his preferred circular brush and palette knife strokes. Similarly the works of Mumba, a Master of Fine Art Graduate from Rhodes University and a lecturer in Fine Art at the Evelyn Hone College in Lusaka is another one of Zambia’s leading abstract painters that have adopted a totally nonfigurative style he has two very different works in the collection, one is from his Messages from Our Ancestors series and features tiny, multi-coloured boxes embellished with an array of idiosyncratic symbols conceived by the artist himself and the other is a haphazard explosion of colour and line that totally eliminates the assumption of any shape or form. Miko, also the curator of the exhibition, possesses a Master of Fine Art degree from Middlesex University he is also a senior Fine Art lecturer at the Zambia Open University. Not only is he an academic and outspoken interlocutor of the visual arts but one of the country’s leading full and semi-abstract painters. 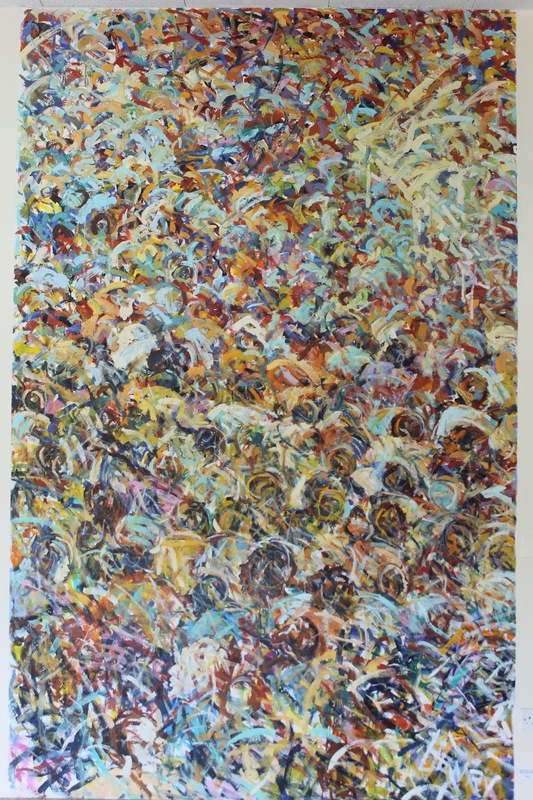 While he is a well-rounded realistic painter and sculptor, his single work in this collection is one of his distinctive crowd scenes executed in his “mark-making” style, a technique that comprises making multi-coloured slashes of paint on canvas, his work Market Place (1989) is a typical example of the style. Also in the collection are a series of drawings by Shadreck Simukanga (1955 – 2004) one of Zambia’s most influential artists, a master draftsman, skilled painter and art teacher under whose hands some of the country’s most prominent young artists have passed. 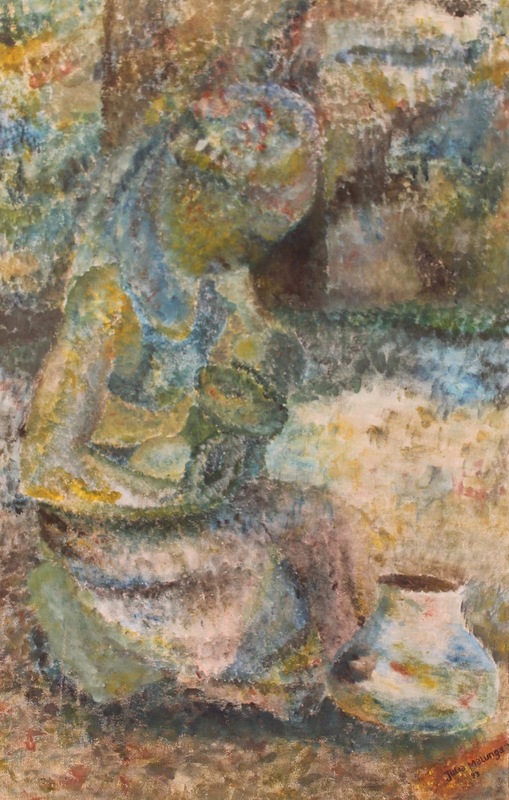 All three figurative works were done in the late 1980s these are The Shoe Repair, a Mother and Child ensemble and a landscape that features a bushy outcrop. Style Kunda’s paintings, Township and Chatting respectively demonstrate how the artist seamlessly shifts from a representational to abstract technique. Considered a veteran, Kunda remains one of the few artists that have been active consistently over a 40 year period. 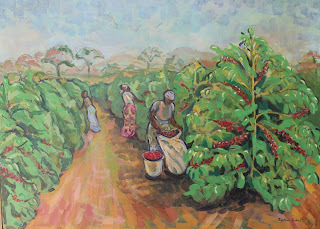 Dean Nsabashi another of the country’s veteran painters expresses himself in acrylic on canvas, often picking everyday life as his inspiration with women and children as his subject matter, Feeding the community, his only piece in this collection is a typical example. Dabson Njobvu a self-taught artist who spent over a decade in East Africa, is a rare oil paint virtuoso identifiable by his meticulous attention to detail and penchant for landscapes with gullies, rivers, forest thickets and village scenes. One of his typical renditions is Mother and child breast feeding which is in this collection. Njobvu’s work is not the only one with a nursing subject, Julia Malunga’s (1964 – 1997) Breast feeding mother (1993) is themed along similar lines and executed in her spotted-colour technique it is a charming mother and child ensemble. Although she died at the age of 33, Malunga remains an influential figure in Zambian art history as she is the only female chairperson of the Visual Arts Council of Zambia. Malunga studied Art & Design at the defunct Africa Literature Centre in Mindolo, Kitwe and worked as a graphic designer in the media industry. The collection also has six prints by three pioneer artists namely Gijsbert Witkamp, Cynthia Zukas and Henry Tayali (1943 – 1987). Witkamp’s The Wall (1986) and Shape of the house (1987) are two specimens of his mastery in the usage of negative and positive space. Witkamp arrived in Zambia from Holland in 1976 and has been active on the art scene ever since taking up many apprentices in printmaking at the Evelyn Hone College printmakers workshops in the 1970s. During his MA Anthropology studies, he did extensive research on indigenous Zambian cultural ceremonies with particular interest in the Makishi of North Western Province. He is also passionate about documenting the Zambian art scene and his well-researched texts on his Art in Zambia Blog give an insightful glimpse in to the Zambian art scene. 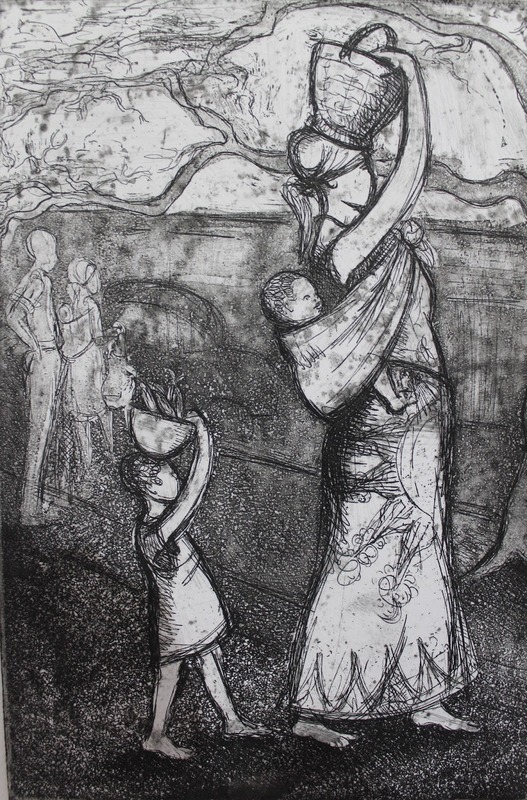 A 1999 lithograph of three calabashes is the only work by Zukas in the collection. 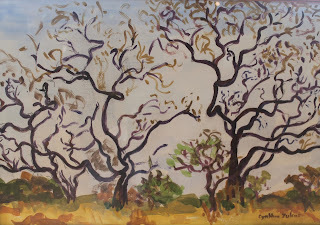 Although she is known for depicting colourful pastoral scenes in oil and watercolour that are inspired by a small family farm outside the city of Lusaka where she often takes sanctuary, her true passion is that of printmaking, she passionately tutored many artists during the Evelyn Hone College workshops in the 1970s and subsequently donated her own press to the institution. Zukas has been active on the Zambian art scene since 1964 and through the Lechwe Trust she has relentlessly supported the visual arts through scholarships, commissions and exhibitions. Her contribution in promoting art has not gone unrecognized, Her Majesty, Queen Elizabeth II of England awarded an MBE to Zukas, in acknowledgment of her services to visual art and to charitable work in Zambia. Two untitled 1978 and 1982 crowd scenes as well as, The madalas by the fireside (1982) and The Chief and his people (1985) mark Tayali’s presence in the collection. The four works show a subtler side of the artist well known to be an all-rounder, dabbling in sculpture, painting and academia. Tayali launched his career in the early 1960s in Bulawayo, Southern Rhodesia at a very young age, upon returning home to Zambia he later proceeded to study a B.A. (Fine Art) at Makerere University in Uganda and an M.A., Kunstakademie Düsseldorf, Germany. 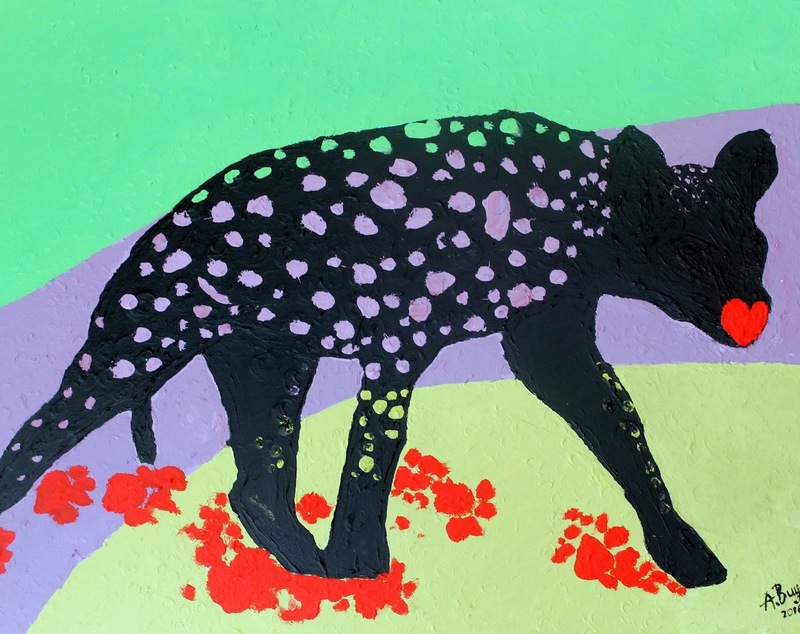 The “Donation” to the Lechwe Trust will consolidate a collection of over 200 works by Zambian artists that date back to the 1960s further reinforcing an already splendid collection of contemporary Zambian art. *This article is an abridged version of the text for the exhibition catalogue Donation written by Andrew Mulenga; look out for a follow-up article that features remarks from ambassador Ofstad, Cynthia Zukas, William Miko and a Zambian artist based in Norway. “Cynthia Zukas’ 50 Creative Years” the eponymous solo exhibition by the veteran painter and printmaker at the Zebra Crossing Café, Ababa House off Cairo Road in Lusaka celebrates the artists 50 year artistic career on Zambian soil. The display of prints, paintings and on-site sketches dating from as far back as 1965 is not only a celebration of an illustrious career, but it gives an intimate insight into the artists personal life as an artist and a journey in to time that affords viewers a glimpse of how the transforming Lusaka art scene over five decades. 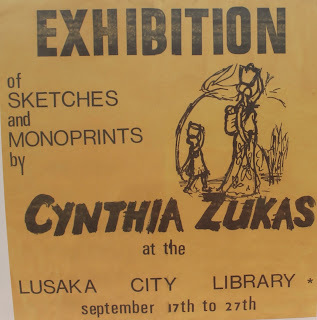 Particularly through reproduced exhibition posters and photographs the show reveals a Lusaka art scene that has transformed drastically over the years. Whereas the main exhibition venues in the capital today are The Henry Tayali Gallery, 37 d, the Lusaka National Museum, the Alliance Francaise and the Zebra Crossing Café, Zukas’ exhibition conjures the obsolete spaces such as the Lusaka City Library, the British Council, Mpapa Gallery, the Anglo-American Centre and Marco Polo all very active places until the late 1980s. 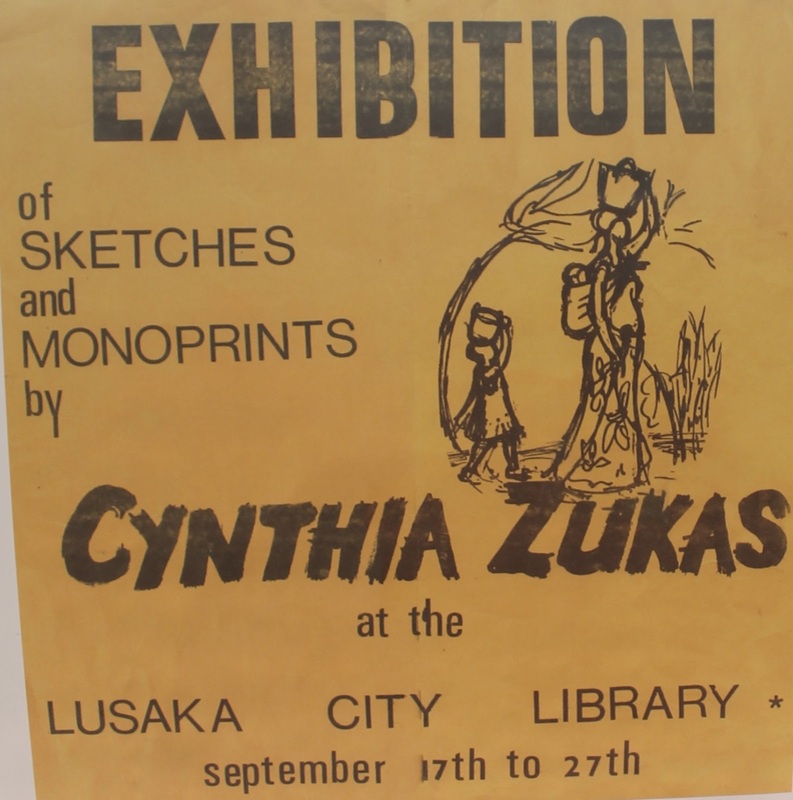 As much as the archival posters reflect a flourishing art scene, it was not always like this, and Zukas actually played an integral role in creating harmony through the early organizations such as the now defunct Lusaka Art Society (LAS) and Art Centre Foundation (ACF) the precursors of the Visual Arts Council. 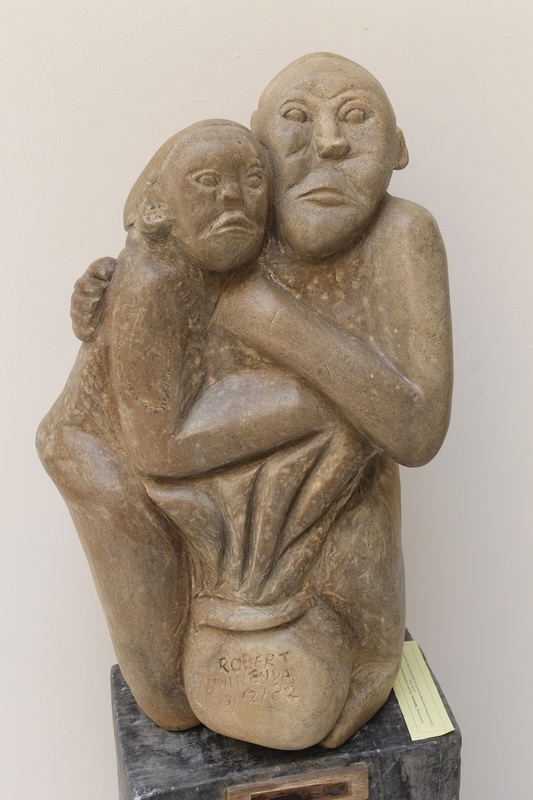 Her roles in these two notable bodies from the early days of contemporary Zambian art are often overlooked. 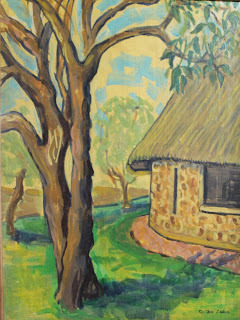 Born in 1931 in Cape Town, South Africa, Zukas attended the University of Cape Town where she obtained a BA in Fine Arts. She came to Zambia as an academically-trained artist and the art scene she found in the newly independent Zambia was “hard to describe”, categorically “because it was like two worlds, it was a hangover from the federation, the Cultural Services Department were doing their own thing involving indigenous Zambian artists and the local whites ran the LAS the sole arts organization at the time, a group she joined in 1965. At the time of Zambia’s independence, interaction between whites and blacks was still very minimal, more so on the contemporary art scene. “I hadn’t been here very long and I saw an advert in the papers that there is going to be a meeting for the LAS, the chairman at the time was the local rep from the British Council, the first few years the British Council was very active, so I thought right, this is my introduction to the art scene here. So I went to this meeting of the Lusaka Art Society,” explains the artist who came to Zambia accompanying her husband Simon, a political activist who was formerly banished by the British Colonial government (of the then Northern Rhodesia) but later invited by the country’s first president Dr Kenneth Kaunda to help in post-colonial nation building. “I had only been here a couple of months and to my utter surprise I was immediately made secretary (of LAS), and I was pretty surprised to find at their annual art exhibition which was open to everybody, still there were no Zambians or no indigenous Zambians at all if you want to use that word. Now one really lucky thing that happened also the same year (1965), I met Bente Lorenz, she had been here before me at least a year or more but before independence,” explains the 85-year-old. She in turn roped Lorenz in to become chairperson of the LAS and the duos first task was to try and widen the society vis-à-vis integrate it with both black and white Zambians. Zukas points out that it was not easy, the few Zambian artists and craftsmen looked with suspicion on the LAS. For the next annual exhibition in 1966, they literally had to scour whatever arts and craft they could find locally. According to Zukas through the 1960s, the Zambian government continued to generously sponsor the arts including LAS which received an annual government grant. “The government was very interested in cultural development, both (Simon Mwansa) Kapwepwe and (Kenneth) Kaunda were very vocal, the Department of Cultural Services had a generous grant”. In addition, the first few years after independence the Department of Cultural Services also supported “annual National Arts Festivals”, although Zukas “cannot remember when they stopped but for the first three or five years they were very good, they got off really to a very good start”. The biggest of these events was in 1967 when the department organised “a festival to celebrate the third anniversary of independence” recalls Zukas. Nevertheless, after the Zambian art scene was integrated to a certain degree, Zukas continued to practice as an artist, holding her first solo exhibition at the Lusaka City Library in 1971 in a show that featured what would later become her signature style. Paintings and prints that depicted pastoral life in peri-urban Lusaka or expressions of urban life in the late 1970 and the 1980s that were characterized by transport and essential commodity shortages typified by citizens, more often women and children in long queues. As her exhibition title suggests, Zukas has been active on the Zambian art scene for 50 years and through the Lechwe Trust she has relentlessly supported the visual arts through scholarships, commissions and exhibitions, her true passion has remained that of printmaking, over the years she passionately tutored many artists during the Evelyn Hone College workshops and subsequently donated her own press to the institution. Her contribution in promoting art has not gone unrecognized such that Her Majesty, Queen Elizabeth II of England awarded her with an MBE, in acknowledgment of her services to visual art and to charitable work in Zambia. In case you have not yet seen “Cynthia Zukas’ 50 Creative Years”, it runs until the end of April. If one was to point out a single flaw in the exhibition, it would be the lack of a catalogue. Surely there would have been no better time to have a detailed, autobiographical catalogue from Zukas that would not just serve as the 50 year account of an artist, but would provide a historic record of contemporary art in Zambia that could also serve as reading material for students of Zambian and by extension African art history. 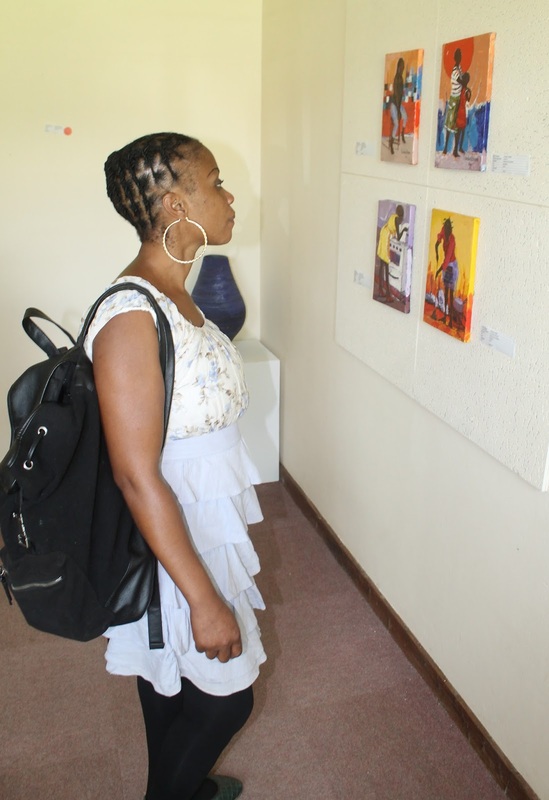 Meanwhile “Donation”, the exhibition of 40 works by various Zambian artists is still on display at the Lusaka National Museum and will remain on display until 22 April, 2016. 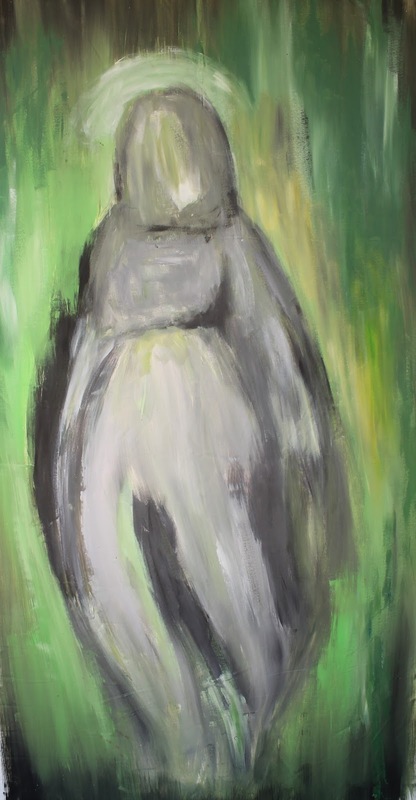 Meanwhile, Lawrence Chikwa’s solo exhibition “Back & Forth – underground/into the light” is currently showing at Modzi Arts Gallery in the Swedish School along Alick Nkata Road in Lusaka and will run until 2 May. Augustine Kagimu and Montford Chinunda, two promising Lusaka-based painters – a Ugandan and a Zambian respectively -- recently held an exhibition entitled ‘Colour n’ culture’ at the Henry Tayali Gallery in the Lusaka showgrounds from the 19th to 31st of March which raised a number of interesting issues in the areas of mentorship, imitation, determination and exhibition preparation. 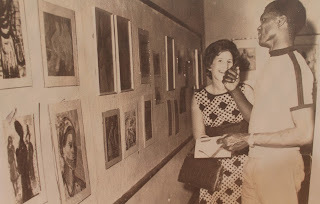 After roughly a year of planning, the young artists hoped to show about 30 works between the two of them, but come opening night, less than 20 pieces were displayed in the gallery because the Visual Arts Council’s exhibition committee rejected most of the paintings by Chinunda declaring the works bared too much of a likeness to that of his mentor Stary Mwaba. Evidently, during the selection pieces a few days before the opening, the word “plagiarism” could be heard reverberating among the committee members at the gallery. Remaining with only two approved works a night before the opening, Chinunda was compelled to create two more to at least replace his many rejected works; this is after he earlier decided to pull out threatening to cancel the show all together. Working overnight, Chinunda was able to create two abstract paintings; one entitled ‘The face behind plagiarism’ in response to what he observed as victimisation and “The African Goddess” a huge canvas that he completed towards 11:00hrs in the morning of the opening day. “Towards the opening I was very emotional because my work was rejected; imagine they were telling me that it was an act of plagiarism. I even wanted to quite but I was encouraged by my friend (Augustine) and a few other artists encourage me,” narrated the 25-year-old in an interview at the end of the exhibition. 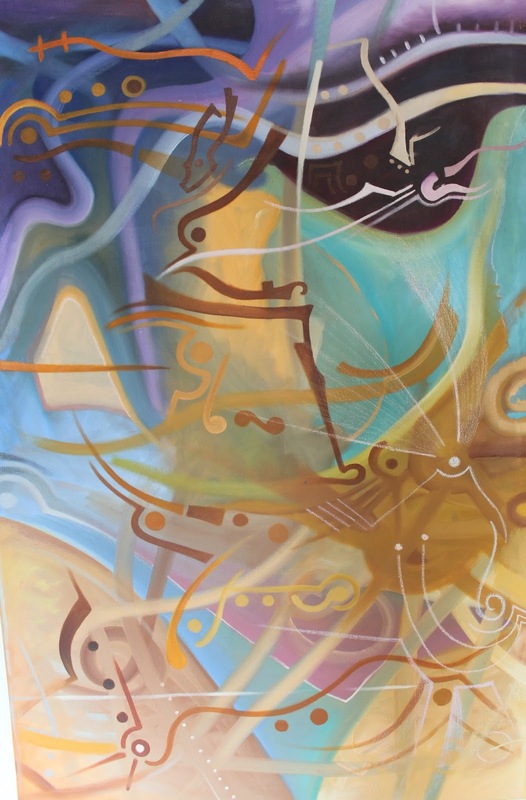 Despite the fact that he has been practicing as a visual artist for some years now and has exhibited extensively, like many of his mentors’ former apprentices he has often been observed as an artist who is neglecting to depart from the style of his coach. This raises the question of; how long should it for an apprentice to fully shed the coating of his or her mentor, or should this even happen at all. It also raises questions on whether Zambian artists discuss issues around mentorship, imitation, art movements and indeed plagiarism. Seeing plagiarism is considered a professional fraud is the word itself not too strong to apply in Chinunda’s case? One of the best examples; the work that was rejected was Nchimunya Mubotu a portrait of a young contemplative young lady in a seated position. 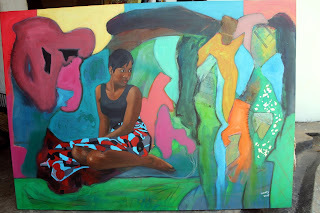 While the subject is depicted with pictorial accuracy, the background is a blurry abstraction of undulating colours, a style which does indeed evoke Stray Mwaba’s. 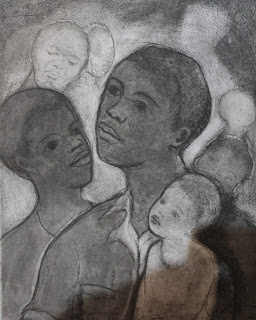 Among Mwaba’s signature themes are portraits inspired by notions of youthful anxiety, which often feature an adolescent boy or girl staring vacantly ahead as if lost in deep thought these would every so often have shadowy figures lurking in the background or towering above them as if to personify childhood fears. 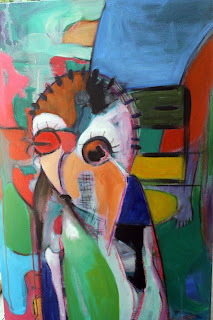 Mwaba’s style has won the appreciation of many Zambian and Euro-American collectors and has placed him among the top selling Zambian artists, which leaves no surprize that his apprentices may want to emulate it. Anyhow, Chinunda maintained that he did not see this recent happening as a glitch but insisted that he considered it as part of the learning process. Besides practicing as a visual artist, he has been involved in many other activities such as teaching art informally at the Kasisi Orphanage in Lusaka. During his school days, he was chairman of an art club at Kalomo High School and was once awarded the best artist in the District Junior Theatre Art Festival by the National Theatre Art Association of Zambia. While his fellow exhibiting artist, Kagimu’s work may also show hints of inspiration by other artists, he did not face the same predicament as Chinunda and all his paintings were approved by the selection committee in the first round. Kagimu’s paintings show an aptitude for colour usage. These bright colours and large format canvases played a significant role in the otherwise gaping studio space that was hard to fill due to the decision to offload the bulk of Chinundas work from the exhibition. In Dancer, one of the more impressive of his works in the exhibition, the 28-year-old reduces the human form to a series of triangular and rectangular shapes all the while suggesting the nonrepresentational image of a dancer which is further highlighted by simple white lines that outlines the head, arms and legs. While he does exhibit this proficiency in painting by day, Kagimu is creative director in an advertising company who also dabbles in photography, film-making, motion graphics, print where he puts together magazines, books, pamphlets and brochures together. Academically, he holds a 2011 BA (Hons) Graphic Design, Nottingham Trent University; he also attended the KBU International College, Malaysia and the graduate of International School Of Lusaka, Zambia. Indeed there are lessons to learn from Chinunda and Kagimu’s show. As much as they are considered upstarts on the Zambian art scene, the opening night was a resounding success if entertainment and attendance are anything to go by. On the night, more refreshments and snacks were flowing than can be usually found during the openings of exhibitions by so-called senior artists. Surely, there must be something this young duo is doing right, and there is no harm in the senior crop learning a thing or two in terms of event organising. All in all, the exhibition exposed a lack of synergy on the part of Zambian artists. It reveals that young artists need as much guidance as possible and when their work is rejected by bodies like the VAC exhibitions committee; the reasons should be put across to them as amicably as possible. Chinunda’s predicament also shows that there is a general lack of art debates, artists are clearly not discussing their work or debating issues around mentorship, copyright and indeed “plagiarism”. The fact that art education at higher learning institution level is inadequate in Zambia is more reasons for bodies such as VAC to go out of their way in promoting gatherings for professional guidance, particularly for the less exposed younger crop of artists. The just ended exhibition, Visual Voice that was held at the former German Embassy building on United Nations Avenue in Lusaka and featured work by a broad range of Zambian artists provided a short-lived, but vital platform for showcasing art. 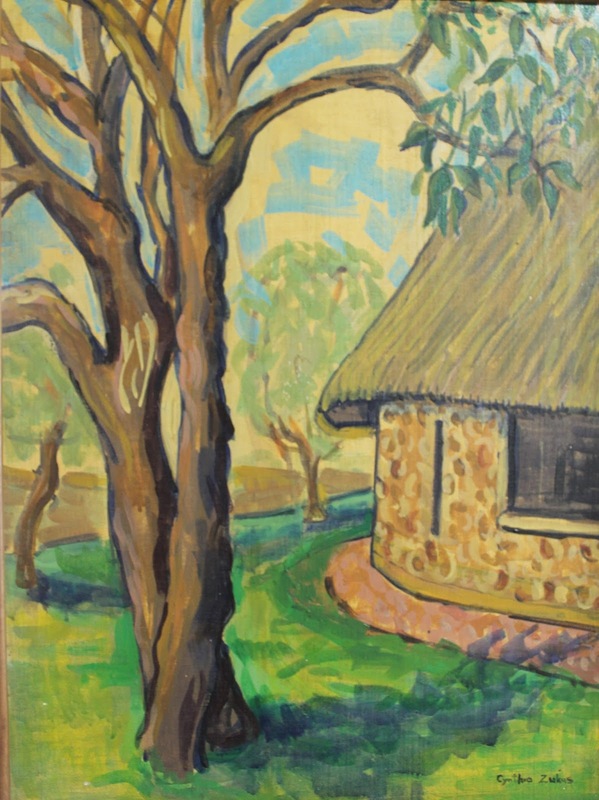 It included Artists of various ages and career levels, paradoxically, the youngest and most unproven artist in the show, 22-year-old Mwamba Chikwemba ended up carrying the day in terms of sales, selling all the work she had on display, whereas the more senior and seasoned artists mostly saw the close of the exhibit without hearing the chime of the cash register. Nevertheless, what integrated the artists on the other hand is that assertion that they all possess an outstanding creative proficiency in painting, sculpture, pottery, printmaking and multi-media installations and primarily their work speaks directly to issues of everyday life. The title of the exhibition Visual Voices was absolutely befitting of the artists whose collective work resonated in a single voice, a visual harmony. This harmony of Visual Voices declared one message; it stated Zambian artists - despite their many needs and challenges – to a larger extent no longer genuflect towards the preferences of a mainly Euro-American collector base who has determine how ‘African’ or indeed ‘Zambian’ art must look like. Therefore, the exhibition did not include idyllic village scenes that depict women with pots on their heads by the stream, mundane wildlife depictions or figurative African market scenes. While the main feature of this show was a 1977 mural entitled African Market, by Henry Tayali, the painting was executed along Tayali’s own terms. He exerted his own agency and created a totally abstract representation of a crowded African market, identifiable only by the vibrant colour reference and the many circular forms that represent multitudes. Similarly, the other artists in the show appeared to probe and challenge the problematic notion of representation as well as archetypes of discourse that pigeonhole Zambian artists to the point of parochial simplicity. 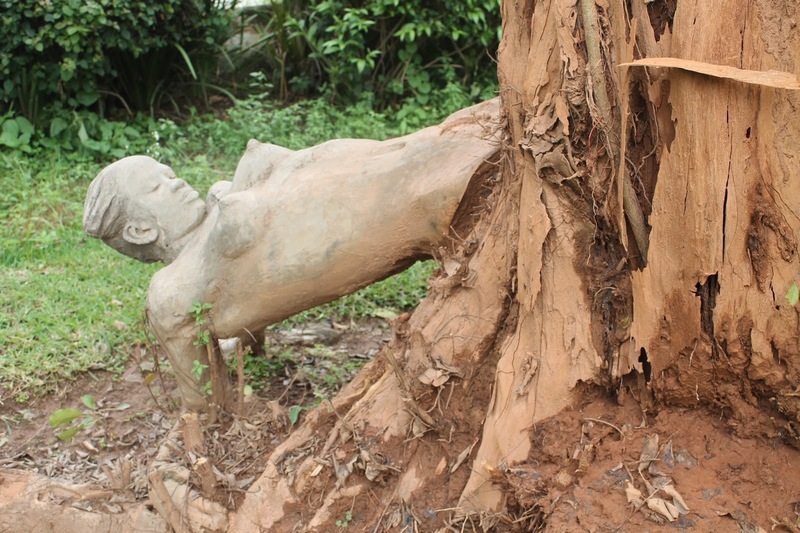 Much of the work maturely played on artistic purpose and the pursuit of ‘Zambian’ or ‘African genuineness’. In this regard it can be added that, much of the work generally addresses notions of cultural politics and likewise the politics of aesthetics. 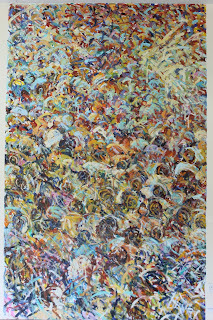 For too long, Euro-American patrons, whom to a certain extent have performed an important role in developing the contemporary art scene in Zambia from the late 1950s to the early 1990s, it is critical to acknowledge and analyse the ways in which they also subjugated indigenous creative expression and dominated the art scene in less favourable ways by shaping, as surrogate citizens, what they thought 'African art' or indeed 'Zambian art' ought to look like. As such, local Zambians were not given enough room to assert their own agency in terms of their own knowledge production as artists. Needless to say the Zambian predicament in has been compounded by the vexed question of funding towards the visual arts, both public and private. There remains need for an increase in the commissioning of works of art, the building of galleries and the introduction of art in public higher learning institutions as well as the general acceptance of art as a tool for economic growth and national development. Although the Visual Voices exhibition did not attract the preferred attention of the Ministry of Tourism and Arts’ top brass, it did attract a good number of school and college tours as well as international delegates from the Inter-Parliamentary Union conference. But indeed the most important visitors would have been a senior entourage from the tourism and arts ministry complete with the ministers and permanent secretaries themselves, perhaps they could have been convinced to purchase the old German Embassy building after being shown that it can serve as a provisional arts gallery or cultural centre. The German Embassy in Lusaka recently shifted to new premises putting the building it occupied since 1977. Meanwhile, Cynthia Zukas’ retrospective exhibition entitled 50 creative years in Zambia opens at the Red Dot Gallery in Ababa House along Addis Ababa Drive on Tuesday, 5th at 17:30hrs and runs until 25th April.